This is an INSTANT DOWNLOAD of THE ORIGINAL set of 2 Scandinavian inspired Ocean Shoreline prints. Each image is offered in many scaleable ratios for you to choose from according to your preferred frame dimensions. The maximum suggested sizes that they can be printed are listed below. Prefer a different size? I can happily email you any size you like. Just drop me a message and I will email the files through after purchase, no extra charge of course. Just print them on your home printer, or have the jpg files printed by your local printing shop like Officeworks, Vista Print, Staples, Target or Costco, or upload them to an online printer like Snapfish or Shutterfly and have then posted back to you. 2: Print #1: Printable art file of 2*3 ratio. These can be printed in the following sizes: 2*3, 4*6, 8*12, 12*18, 16*24, 20*30, 24*36 inches (up to 60*90cms). 3: Print #1: Printable art file of 4*5 ratio. These can be printed in the following sizes: 4*5, 8*10, 12*15, 16*20, 20*25, 24*30, 28*35, 32*40 inches (up to 80*100cms). 4: Print #2: Printable art file of 2*3 ratio. These can be printed in the following sizes: 2*3, 4*6, 8*12, 12*18, 16*24, 20*30, 24*36 inches (up to 60*90cms). 5: Print #2: Printable art file of 4*5 ratio. These can be printed in the following sizes: 4*5, 8*10, 12*15, 16*20, 20*25, 24*30, 28*35, 32*40 inches (up to 80*100cms). Each jpg scaleable file is of a very high resolution at 300dpi (dots or pixels per inch). This simply means that they will look very sharp and clear no matter which of the listed sizes you print. You can even print them much bigger than the sizes listed and they will still look great. Needing a different size? Just send me a message and I'll send them through, no extra charge of course. After checkout you will receive an instant link to download your files right from your checkout page. If you checked out as an Etsy guest, you will receive an email from Etsy with your order ready to download (though not from a mobile device). You can also access your downloadable files at any time through your Etsy Purchases and Reviews page. Prefer the two images joined together as one long landscape image? Please send me a note after purchase and I will email you the landscape file. Please note colours on different monitors may vary slightly and may be different again with each printer. 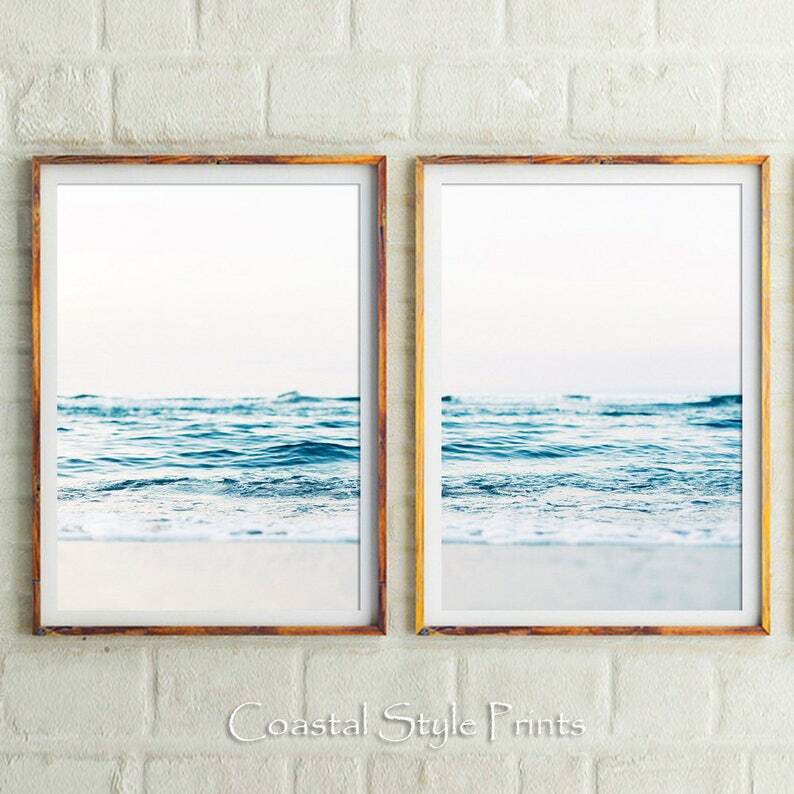 All artwork copyright © 2019 Coastal Style Prints. Purchase is for personal use only. Not for resale. 50% off store wide post Easter sale for a limited time. Not to be used with any other offer. These prints are perfect. They look fantastic over my headboard in my room and really bring the serenity I need. Great quality! I love these prints. One image is a tad more gray then the other but overall good quality. I received many compliments so far on it! Beautiful addition to our gallery wall! I will gladly accept custom orders. Just contact me and we can discuss your needs. I offer downloadable print files in most of the popular frame sizes. If you don't see the size or ratio you are after, please contact me.